Despite his recent success, painter Gerry Otis Simpson, better known by his art-world moniker, GOS”, only ever picked up a paintbrush for the first time as a way to decorate his walls cheaply. But what began as the result of thrift has evolved into a blossoming career. 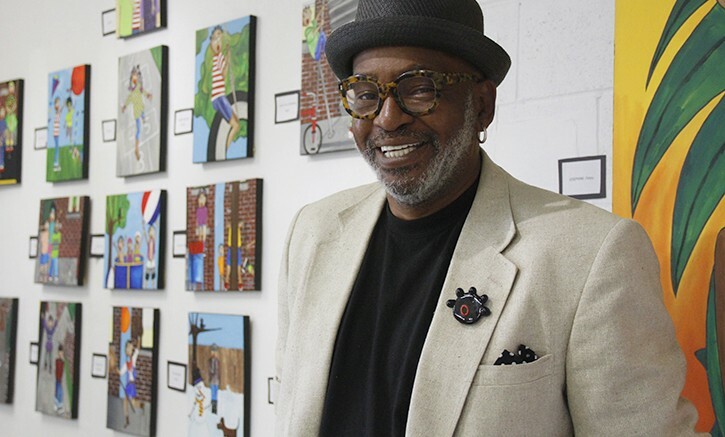 The former American River College visual merchandising professor opened his own art gallery this summer on Del Paso Boulevard to a crowd of over 300, and has made waves in the art world with his colorful, pop art depictions of African-American life. Simpson gets his ideas for his paintings from his everyday life. He first started with kids (based on his own), which are still a focus of his art, as evidenced by his “Let The Children Play” series, a collection of paintings depicting children in urban environments at play. Years after picking up his first paint brush, his works have been featured on TV shows like 90210 and on permanent display in various locations including the UC Davis Medical Center. One of his personal favorite paintings, “Pop Icon Float Like A Butterfly,” just came back from being on display at the Muhammad Ali Center in Louisville, Kentucky. Originally from New Jersey, Simpson has been involved in creative ventures since he was a child, including music, modeling, photography, and notably fashion merchandising—the reason he came to California in the first place. After winning a trip to California through a fashion contest, Simpson began working in San Jose as a stylist for Nordstrom. Simpson moved to Sacramento to work as a merchandising manager when Nordstrom opened at Arden Fair Mall, and it was there that he met ARC interior planning and design professor Marie Cooley. “I met Gerry and was blown away by his knowledge and personality: I knew he would make a great teacher,” said Cooley in an email. Cooley hired Simpson as a professor of visual merchandising and fashion promotion for ARC’s fashion department. He held the job for 10 years before leaving to pursue other interests, but was transformative to the program during his time there. “(Simpson) taught our VM class for many years and brought it to a wonderful, para professional level … People who were regulars at the Oak Cafe would arrive early just to look at the window displays from Gerry’s classes,” Cooley said. Meisner-Bell is still in close contact with Simpson, and said she was initially “drawn to (Simpson’s) personality” when they first met. Over the years, a close friendship developed between the two. Simpson remembers his time at ARC fondly. He said that teaching at ARC will always be one of the things he is most proud of and is one of his most memorable moments—and fashion is still a large part of his life, as is apparent when browsing his gallery. The sharply-dressed Simpson has filled his space with brightly colored paintings, mannequins, and figures. The walls of the Del Paso “galletique”—a portmanteau of “gallery” and “boutique,” he uses to describe his space—are lined with shelves meticulously decorated with trinkets in a way only a merchandiser could. 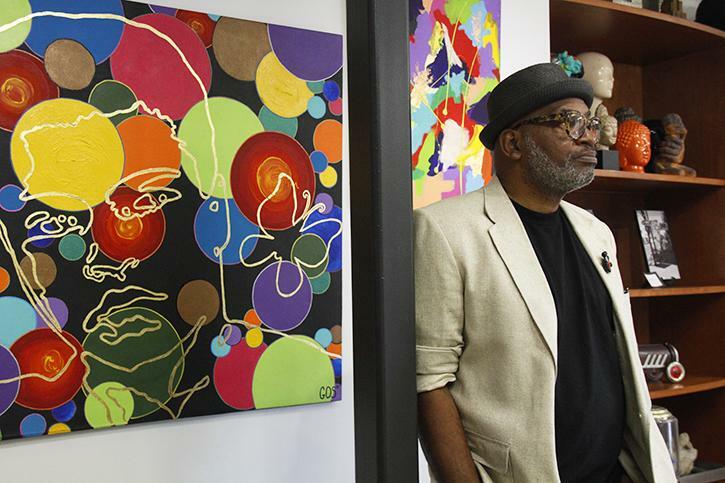 For now, Simpson’s main goal is to bring more artists into his space to showcase local up-and-coming artists and reinvigorate the Del Paso artist community. The community of artists in Del Paso Heights was once bustling, but after the murder of a gallery owner in the late ’90s and the development of artist housing in midtown, the scene mostly moved downtown. Like his many personal reinventions, Simpson now hopes to help reinvent the community, and wants his “galletique” to be a catalyst for resurrecting the cultural spirit of Del Paso. “I want to be what makes Del Paso come back alive,” Simpson said. Emily Thompson is a first-semester student on the Current and the co-editor of the Scene section. She is majoring in journalism and plans to transfer to the University of North Carolina. 1 Comment on "Former ARC professor paints a different scene of Del Paso"
Will you add some contact info for him and his gallery – perhaps a Facebook page or website? Thank you!